The end of the [2002-200?] bull-market? Take a look at this snapshot of the ETF universe from May 10, 2006. It may be offering a glimpse of the last days of a bull-market (2002-2006). The X axis represents (daily) change correlation with the SPY (The S&P500 ETF) calculated over the past year (and where the ETF is less than a year old, a fraction of a year). The Y axis represents beta (relative volatility) of the ETF vs SPY. The size of the bubbles represent PE. The bigger the bubble the more overvalued the ETF is. The bubble on the far right exactly on the '1' vertical line and on the '1' horizontal line is SPY (the S&P500 ETF) itself. 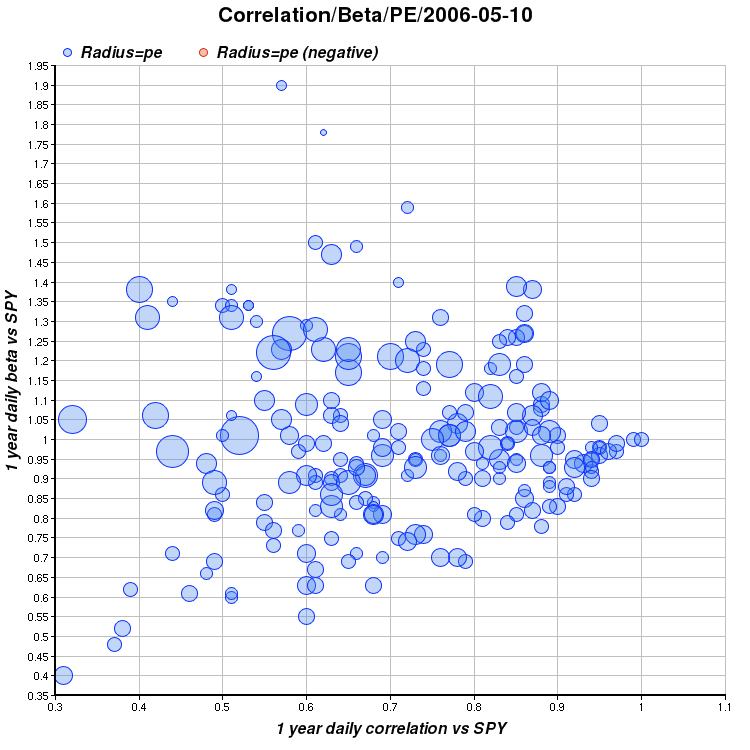 Obviously, it is perfectly correlated with itself and has the same volatility as itself. Could this might be the end of the bull? Narrowing breadth: less and less stocks make new highs with the most darling narrow group (in this case: commodities, emerging markets) making unusual unsustainable runs. The speculative peak was followed by a sudden rise in average beta (volatility) and more importantly a sudden increase in the correlation as everything started coming down, especially the last-remaining darlings (energy, commodities, and countries exporting commodities, gold, silver, oil). This bull market, unlike the one that burst in early 2000, has not been characterized by outrageous valuations. In fact the broad index valuations are still pretty reasonable: In May 2006, the S&P 500 for example was trading at about 15 times trailing earnings. While this isn't very low in historical terms, it is definitely not high. Moreover, it is not even remotely close to the hights it reached in early 2000. Unrealistic expectations for continued growth in corporate earnings. Earnings growth rates have been slowing down. Crude Oil prices which reached over $70/barrel and over $3/gallon at the pump in the US, were leading to erosion in consumer spending and confidence. Fed interest rates hit the psychological 5%, a threshold which may not considered low anymore. A speculative bubble in US house-prices as a result of a prolonged environment of very low interest rates. Many buyers were financing houses with interest only, and adjustable rate loans in a raising interest rate environment. Many earlier buyers were taking cash out of their inflated equity. Some speculative action in commodities, especially in precious metals, and some emerging markets, which drove prices too far too fast. Japan's federal bank signaling the end of a zero-interest rate policy. Whenever markets become bearish, the sharpest drops occur in the highest beta stocks. Those that rose the most leading to the peak. In this bull run, emerging markets and commodities led the way. On a relative basis, US small caps should be hit harder than large caps after their impressive run up in the past few years. On one interesting note, the home-builders (XHB) have started their sharp decline earlier in the year increasing their beta and shrinking their (trailing 12 month) PE to a very low 7. Despite the housing bubble being burst, the home builders have already corrected sharply (in anticipation) and some are starting to almost look attractive. If you have a diversified asset allocation strategy, stay the course. Be aware that some high beta components might lose much more value in the coming months and if you haven't rebalanced after the big run it might be a good time to do so now. If you are more active, stay defensive. A coming relief rally if the Fed doesn't raise interest rates in its coming June meeting, might be a good point to do some rebalancing moves in order to capture some of the big run-ups of the past 4 years. I believe that if we have a bear, it will be shorter and milder than the 2000-2002 one. As already mentioned, the valuations are nowhere near what they were then. Moreover: corporations have much stronger balance sheets and actual good earnings this time. Lastly, the duration of the preceeding bull has been much shorter this time, another reason why a prolonged bear is unlikely (usually prolonged bulls precede longer bears). A US recession (decline in GDP for two or more consecutive quarters) might be possible, though less likely, due to the US consumer weakness and a housing crash in many parts of the US (Florida being the worst). The good news is I believe this time the US is becoming less "the driver of the whole world economy" due to very strong economies in many emerging markets. Emerging markets are feeding on China and on themselves. Foreign currencies are being preferred over the dollar (due to the growing US trade deficit). Also: the much anticipated continuing weakness in the US dollar can eventually help US exports. Finally, being an optimist at heart helps me envision a future with less dependence on Oil, the US military getting out of Iraq, and less government spending, all of which should help the markets reach new highs. My fear of a mild bear has turned up wrong, for now. We had a mild correction in US equities (about 10%) and a bigger one in emerging markets (a bit over 20%), but most stocks have quickly recovered. Large-Caps were the first to break new highs with the S&P 100 outperfroming the broader S&P 500. The most dramatic shift was in energy prices. Oil prices fell sharply in the summer, helping consumer confidence and improving buying power. Prices at the pump in the US went from above $3/gallon to a bit over $2/gallon. This is a huge (33%) change. While some of the ETFs that crashed the most (Emerging Markets, Precious Metals, Energy) are still well below their highs, it looks like many of them, may be getting there by December or January. What this should teach me, of all people, is what I should have known for a long time: timing the markets is very very hard, if not impossible. A sound asset allocation plan emphasizing value, low-volatility, dividends and a long-term view, is the best course forward. In the coming ETF reports, I will start publishing a portfolio allocation that is very close to what I'm actually invested in so I can benchmark the ideas against others and so it keeps me honest.